On Monday, Paul Joseph Watson, citing the Black Lives Matter “guiding prinicples” page, said the racist, anti-cop organization seeks to destroy the nuclear family. The notion of collective communities being responsible for children and not parents is an idea that has been pushed by the leftist establishment before, most notably during a piece for MSNBC by Melissa Harris-Perry in which she said the notion that kids belonging to their parents was outdated. 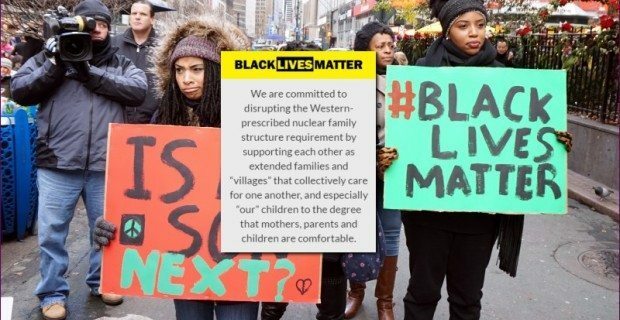 Instead of encouraging strong parenting in the black community, which has been ravaged by the scourge of single parent households and illegitimacy, BLM is telling them that the traditional nuclear family is a bad thing and that they should relinquish control of their children. What this shows, however, is that Black Lives Matter, despite its claims, is really nothing more than just another radical front movement designed to implement a form of communism in the U.S. — and it’s all being funded by the likes of George Soros.